These little squares are about 2 3/4 inches each, just two rounds of a basic solid granny square done with worsted weight (medium weight 4) yarn and an H hook. Each one only takes me about 7 minutes to do up, including weaving in the starting tail. They begin to add up quickly, so satisfying to finish one and add another to the rest. 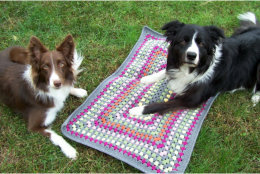 I am thinking the throw will be about 16 by 20 squares (320 squares), although that may change as it is assembled depending on what I decide to do with the border, it may need to be bigger than that. A voice in my head whispers (the voice can do math)… the ends, all those ends to weave! Two ends for each and every one of those many, many squares! Shhh, shhh, I will weave in the beginning ends as I go, so the weaving of the ends will be half done! In a sliding ring (or you could ch4 and slpst to make a ring instead). Ch4 (one ch to secure the ring, and ch3 that counts as the first dc). 2dc in ring, ch3. [3dc in ring, ch3] 3 times. Close the loop, slpst to top ch of the beginning ch3, going through 2 loops of the ch. Do not end off. Ch3, dc in the top of the next 2 sts. [2dc, ch3, 2dc in the ch3 space. Dc in the top of the next 3 sts] 3x. 2dc, ch3, 2dc in the last ch3 space. Slpst to the top ch of the beginning ch3. End off, leaving a long enough tail for sewing the square to two sides of another and weaving in the end (I leave about 16 – 18 inches). Weave in the beginning end of the square. 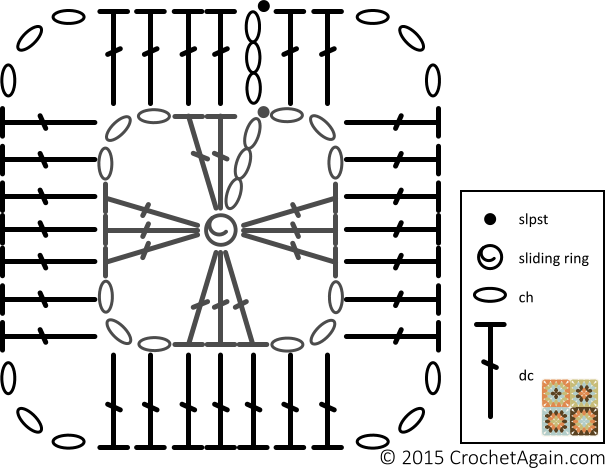 And a diagram of the square, so much easier than reading directions! 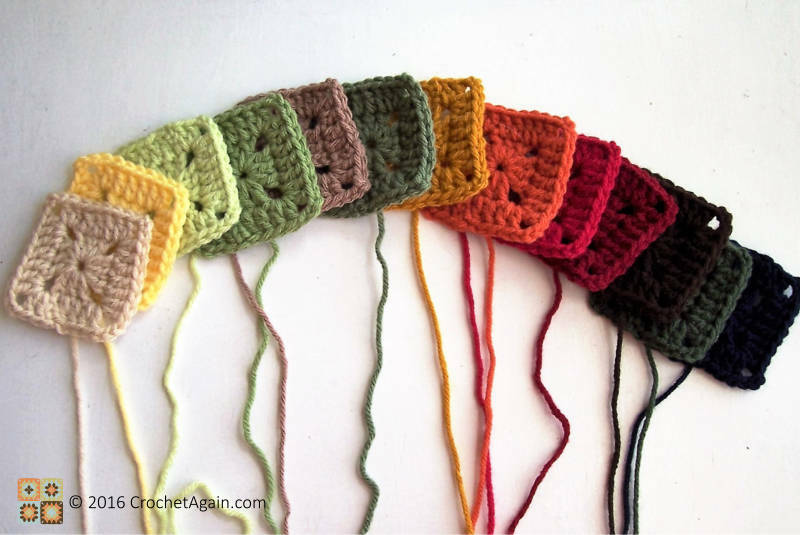 Have you thought about using the ends to attach the squares together as Lucy at Attic24 does? Yes, I mentioned in the pattern to leave a long end to sew the squares together with. Ah yes, I see you did. Hello Sue – a couple of questions. Do you use a specific computer program to draw your charts, and if so can you tell me which one? I have seen this pattern only with 4 trebles at the beginning and it was joined as you go (or went, LOL) at each corner. I was thinking of trying it and couldn’t find a pattern until I put a search on and found yours. I do know how to do these squares but like a bit of confirmation by looking at other peoples’ way of doing things. I’m not wondering about joining as you go because there would be a lot of gaps. I may just do what you have said and use the yarn ends. Thank you. 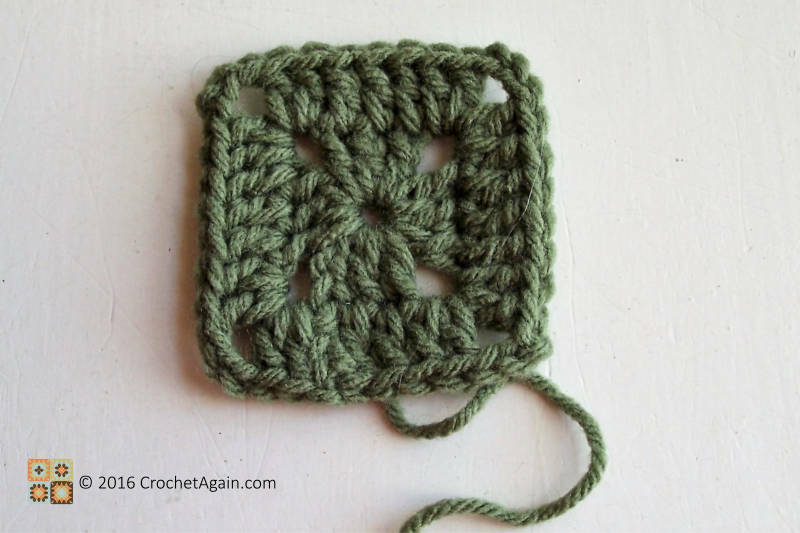 Hi I was wondering if you had instructions for how you use the tail ends to join your squares together. I’ve started a project using your pattern but am drawing a blank on how to use the tails to join them together. I’d love to avoid having to use another color to pull them together. Thank you by the way for this super simple little square. I love it! I don’t have instructions for that. When I end off, I leave a long enough piece of yarn so I can use it to sew it to others. Love the colour combination, do you have a list of them? I don’t seem to have a list. All of the yarn is Michaels Loops and Thread, so if they are all still available you should be able to find them. What is a sliding ring?